Euromining is the leading mining technology trade fair in Europe. 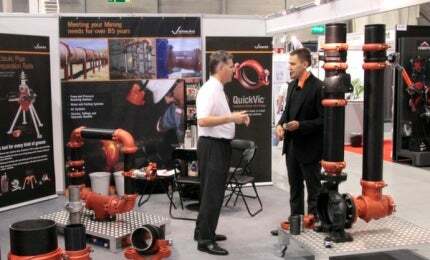 The international EuroMining 2015 trade fair brings industry professionals from all over the world to Finland in May. This event offers operators in the growing mining sector a forum for making international contacts, showcasing new products and discussing future solutions. EuroMining brings professionals of the mining, quarrying, geology beneficiation, processing and metallurgy industries to the Tampere Exhibition and Sports Centre on 20-21 May 2015. There is a demand for well-organised fair trade event in the high-growth industry of mining. In addition to its location and functional transport connections, Tampere also has great premises and accommodation possibilities as a venue. Furthermore, there are plenty of companies such as Metso Minerals, Sandvik ja Robit Rocktool and other local equipment suppliers in Pirkanmaa. In terms of employment, the extraction industry is one of the most promising business sectors in Finland, particularly mining that has grown significantly over the past few years. The total net sales of mining companies in the country is approxmately €1.5bn and the industry provides employment for 4,500 people. The number of employees is expected to exceed 7,000 by 2020. However, the entire cluster is more significant in Finland. The industry provides employment for approximately 30,000 people and processed metals accounts for approximately 15% of the country’s total export market. EuroMining 2013 had 191 exhibitors from 11 countries. The direct exhibitors came from Finland, Belgium, Denmark, Estonia, France, Germany, Italy, the Netherlands, Russia, Sweden and the US. In addition, the seminars introduced Finnish mining specialists and international speakers from Australia, the UK, Canada and Turkey. The event attracted a total of 3,874 visitors. In addition to Finland, Europe’s biggest mining technology trade fair attracted visitors from 40 other countries such as Australia, Botswana, Chile, China, France, Germany, Ghana, India, Indonesia, Kazakhstan, Norway, the Philippines, Russia, South Africa, Sweden, Tajikistan, Turkey, the UK, Uzbekistan and Zambia. Tampere Trade Fairs organises the fair in cooperation with the Finnish Association of Mining and Metallurgical Engineers and the ‘Green Mining’ programme of Tekes, the Finnish funding agency for technology and innovation. Tampere Trade Fairs is one of Finland’s most significant trade fair companies and organises dozens of high-quality, professional events and consumer fairs in Tampere every year. Trade fairs are a place where demand and supply meet, producing tangible results and serving all participants. For exhibitors, trade fairs are an unparalleled opportunity to increase their sales and familiarity among their target market, maintain their client relationships, expand their cooperation network and strengthen their company image by individually meeting customers. For visitors, the events present an opportunity to make acquisitions, request for tenders, find out more information and compare the products of several suppliers under one roof.